BULLET 500 - Indias first 500 cc motorcycle. of the design. The power. The smooth performance. And the superlative stability. BoreXstroke 84x90mm Fuel tank capacity 14.5 lt. 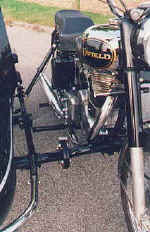 The Royal Enfield Bullet. Indias most awesome motorcycle. A machine that has grown to become something of a legend. Everybody gapes at a Bullet. Only a few own one. And even fewer, this deluxe version. BoreXstroke 70x90mm Fuel tank capacity 14.5 lt. LIGHTNING 500 - Royal Enfield unleashes a bolt of lightning. The LIGHTNING 500 - the first super bike to be launched by Royal Enfield in 1997. It combines the cruiser looks and chopper styling so popular the world over. The LIGHTNING 500 is for the dude with the "Who needs a car when you have a bolt of lightning?" attitude. Look out for it in select Indian cities now and all over India in the April/June quarter of 1998. Its worth waiting for the ultimate motorcycling experience. Bore X Stroke 84 X 90 mm Fuel tank capacity 14.25 lt.
- High-lift handle bars, bucket seats and tear-drop shaped fuel tank. - Instrument cluster with tachometer, speedometer, fuel gauge and neutral indicator. - 12 V ac/dc system with 45/40 W headlamps. - Fully chrome plated air filter box. - Chrome plated lockable battery cover. - Metallic twin color paint scheme on body parts. - Slim front and rear mudguards. 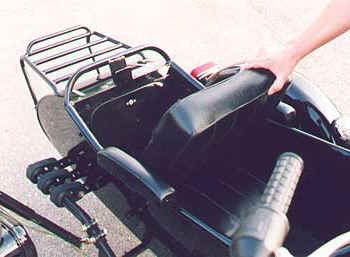 - Cushioned backrest for pillion. - 7" twin lead front brakes. - Color options: burgundy/sandal wood, metallic grey/ black, purple/ metallic grey. 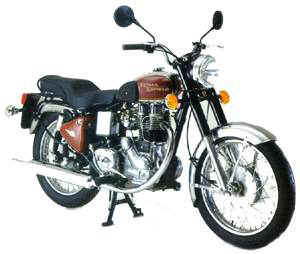 Engine: 535cc, four-stroke, air-cooled, petrol. Khardung La  the worlds highest motorable pass. details: Giddy heights, rocky terrain, snaking roads, no sign of life for miles, lots of courage, and a dream. destination: This is the story of the 42 riders who took Enfield Bullets up to Khardung La, the worlds highest motorable pass, over 18,000 ft. above sea level. - Vasudev Prabhu, a member of the Bullet Club Bangalore, relives The Ride to Khardung La. There is something inarguably mystical about the mountains. And if you are fortunate enough, you can hear the mountains beckoning you. On 26th June 97, 42 riders answered that call. And I was among them. Our mission was to reach the Khardung La top, the worlds highest motorable road, on our Bullets. For the Bangalore Bullet Club, it was a truly special occasion. A wonderful way to celebrate Indias 50th year of independence. This ride was a dream that we had been nurturing for one whole year and we were really glad to be sharing it with other like-minded Indians. The 14-day expedition took us through almost 3000 gruelling kilometres. Together, we rode through sand and stones, wind and rain, slush and snow, mud and water, ice and mist. And as we rode higher and higher, there unfolded one of my most unforgettable experiences. Each turn was more breathtaking than the last. And each curve transformed the view almost beyond recognition. The terrain changed rapidly too. Loose gravel one moment, slush and boulders the next. Knee deep waters trading places with pristine snow. In fact the only thing that remained unchanged was the thump thump of my bike. Her steady heart beating in unison with 39 others, drawing from them the confidence and courage to go on. Yes, up in the mountains, even a hiccup by Mother Nature can humble mankind. But she is often kind enough to let the human spirit triumph. And triumph we did, reaching Khardung La on July 3, 1997. The spontaneous jubilation that erupted at 5605 meters above sea level can hardly be described in words. There were bear hugs and whoops of joy, tears and impromptu speeches, cameras and toothy grins. The fear of heights and the discomfort of rarefied air disappeared, giving way to a newfound confidence. s t r a n g e r s and slept in dhabas and s c h o o l verandahs (on the Delhi-Bangalore leg). I have shed tears for my bike and I have laughed at myself. I have lost my mind and gained a ton of confidence. But most of all, I have won the greatest of assets: the friendship, love and respect of 41 wonderful people. To them, and to my Bullet, I have just one thing to say. Thank you!. Or, as they say in the mountains: "Thauk Jai Shey!!" Long live the spirit of adventure! Established in 1955, Royal Enfield Motors is now a part of the Eicher Group of Companies  a Rs.10 billion conglomerate. The Eicher Group has a range of interests in the automotive industry, including tractors, automotive gears, small trucks, exports, management consultancy and cartography. Royal Enfields corporate philosophy is built around quality and unflinching loyalty to the customer, reasons why the legendary Bullet is not just a bike but a motorcycling icon. Back home, it is a symbol of status to own a Royal Enfield Bullet and ride across the vast plains of India on it. The ruggedness and reliability of the bike is endorsed by the army, the police, the paramilitary forces and over 500 institutions which form part of the die-hard customer base of the Bullet, dubbed the "Rajagadi", or royal vehicle. This loyalty is also engendered in the Bullet Club, a vibrant community of Bullet owners, who live a life of adventure and freedom, on their Bullets. The company operates out of 13 area offices, 19 depots, over 250 dealers and 150 authorised service centres in India. Royal Enfield also exports to over 20 countries including Japan, the USA, Canada, France, Germany and the UK. Welcome to Royal Enfield Motors. Makers of the legendary Royal Enfield Bullet. 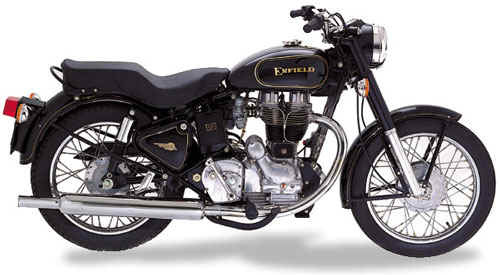 Weve come a long way since 1955, when the first Royal Enfield came into India. New technologies, new directions  these have been the highlights of the Royal Enfield India story since then. While always retaining the essential Royal Enfield traditions. The driving force for this change has been, without doubt, the fierce loyalty that you, the Royal Enfield rider have shown to the company, its products and its philosophy. The Bullet, in particular, could never be the bike it is today if it were not for the Bulleteers love for it. The company, to provide greater value to the Bulleteer, has constantly upgraded technology and introduced higher powered models to satiate your growing urge to scale greater heights, travel on unridden paths and make the bike perform harder. This spirit of adventure, freedom and oneness between man and machine is what makes the Royal Enfield more than just a motorcycle. It is this spirit that comes alive when Royal Enfield riders come together to go on The Ride. With its classic looks and unmistakable sound, the Enfield Bullet is equally at home on a Sunday ride as it is in town commuting. And its great gas mileage and low maintenance means you save money.